Welcome to WOW! 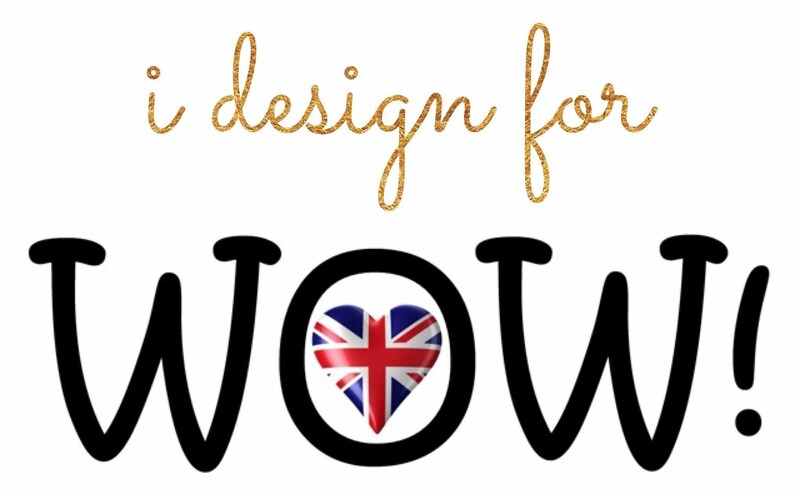 Embossing Powder and Pink & Main Collaboration Blog Hop! If you came here from amazing Ankita's blog, you are on the right track. 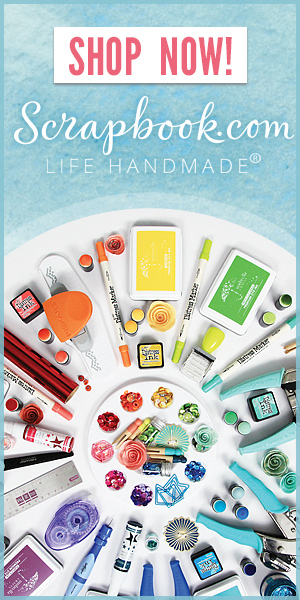 If not, please check out full blog hop list at the bottom of this post. For today, I prepared a simple hanging decoration to share with you. Let's get started! 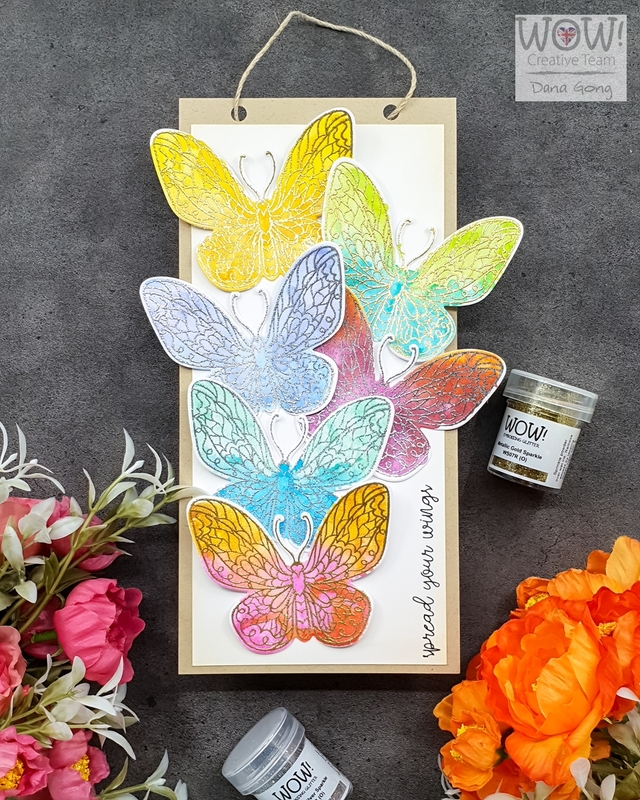 First, I rubbed 2 kinds of distress ink pads onto solid butterfly stamp from Pink & Main You Can Fly Stamp Set and spritzed water to it using mini mister. I then stamped it onto bristol paper and let it dried using heat tool. With a same process, I created 6 butterfly images. After they dried completely, I heat embossed them in gold and silver. 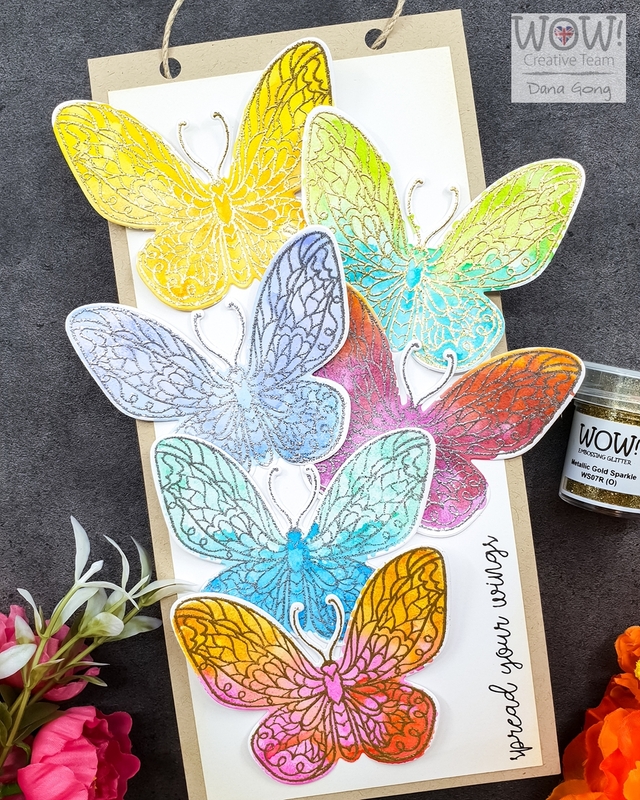 For heat embossing, I used Embossing Pad, Metallic Gold Sparkle and Metallic Silver Sparkle from WOW and You Can Fly Stamp Set from Pink & Main. Then, I die cut them out with Coordinating Die. I trimmed down kraft Paper into 4 3/8' x 8 1/2' and bristol paper into 3 3/4' x 8'. I slightly ink blended a bristol paper with Antique Linen Distress Ink. Then, I stamped sentiment from You Can Fly Stamp Set where I wanted. I punched holes and added hemp cord as shown. To finish, I arranged butterflies and mounted them using glue. 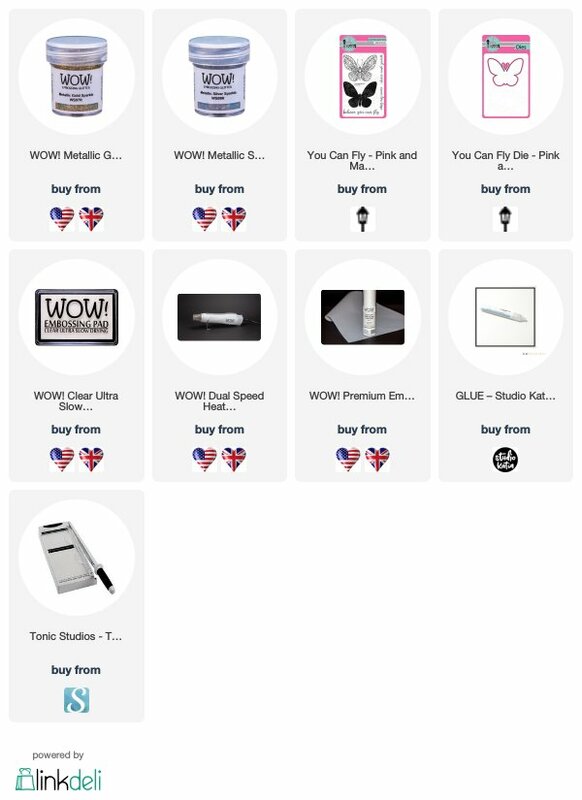 We are giving away $25 gift certificate to Pink & Main store, 6 x powders + carry case to the WOW! Embossing Powder Store. 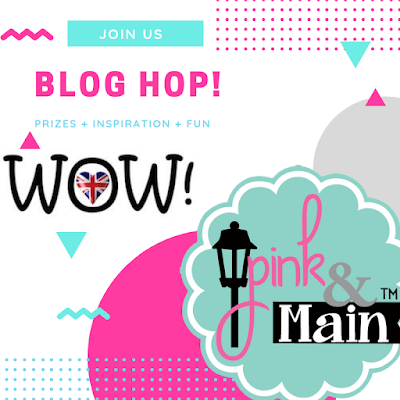 Winners will be announced on both Pink & Main & WOW! 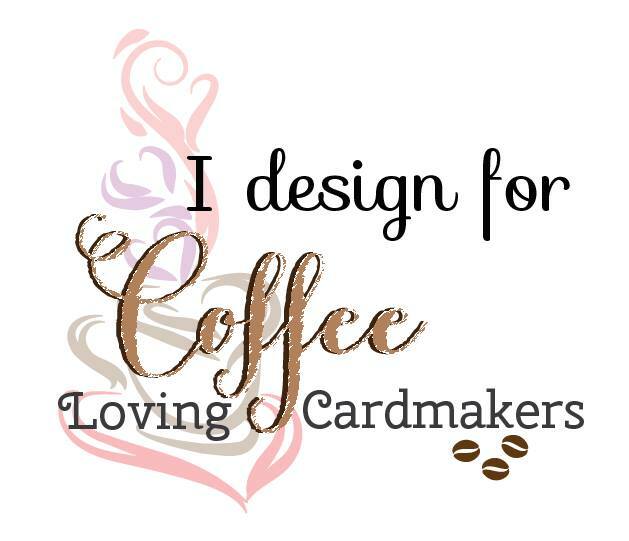 Embossing blog on Wednesday, October 22, 2018, 9am Eastern Standard Time. Your next stop is Donna's blog. Happy hopping and good luck! Beautiful butterflies! Love your project. Gorgeous butterflies! 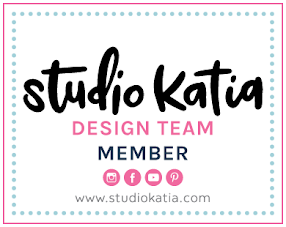 The embossing and soft colors are so very pretty! Such a beautiful project! 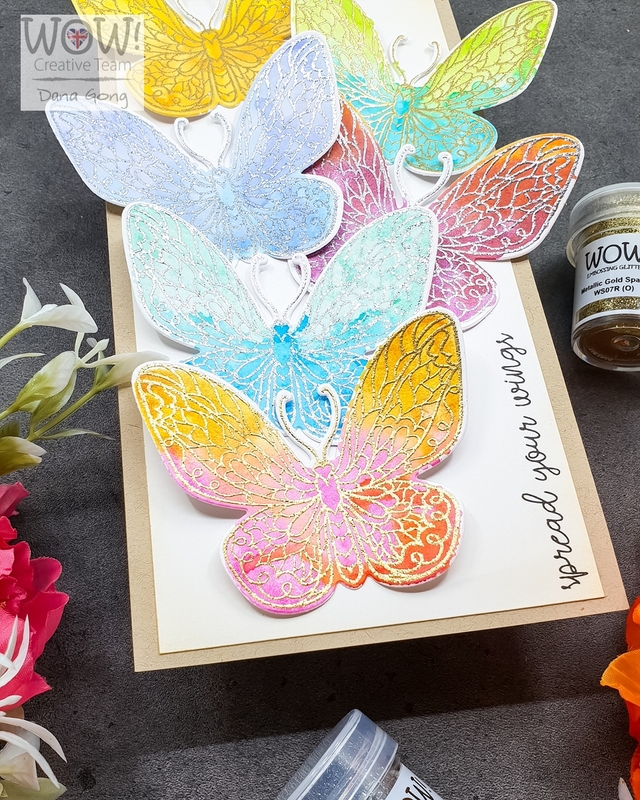 I love the different colors of the butterflies and the embossing powders give such detail and sparkle to their wings. Those beautifuls leave me speechless! The veins you created with the embossing is just out of this world! Just stunning! Thank you for sharing your talents with us! Love the colours, the embossing highlights them well. Lovely detailed butterflies. Nice motivational hanger. I love, love your beautiful butterflies. Beautiful and inspiring. Love the colors and the embossing. Beautiful project, Dana! 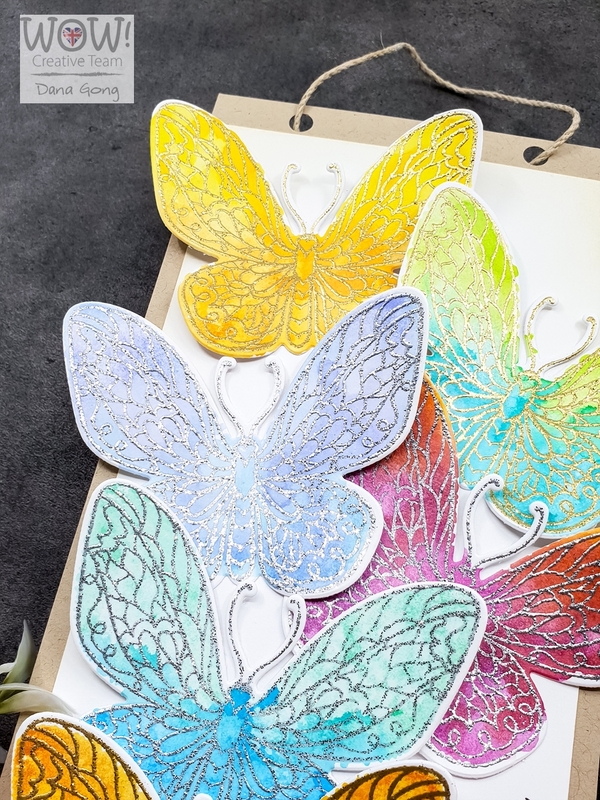 I love those gorgeous, embossed butterflies! Butterflies are always beautiful on a card. embossing takes them to the next level. Love this sweet and gorgeous creation! Love the sparkle! Gorgeous butterflies! Wow! When I say the Metallic Silver Sparkle, it was like finding the perfect Silver Embossing powder. Butterflies are lovely. Thanks for sharing. Oh my!!! Your project is too cute!!! Love it!! !